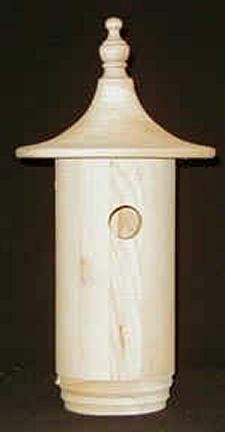 This birdhouse will attract several species of birds including bluebirds, tree swallows, titmice, nuthatches and house wrens. Included is a double-ended dowel screw to provide easy mounting on a post or other flat surface. The removable roof provides ready access to the nesting cavity for cleaning after the nesting season is completed. As with all our Garden Designs, it is recommended that this item be treated with boiled linseed oil or another non-toxic sealer to insure many years of enjoyment. These birdhouses are made from Eastern White Pine wood.